As many analysts expected, the government’s strategy of using the popular verdict as a means of pressure in the negotiations backfired. Upon returning to the negotiation table, the hardliners around German Finance Minister Wolfgang Schäuble made clear that they are prepared to let Greece go bankrupt — with all the economic and political implications this would have for the Eurozone — rather than see the slightest crack in the neoliberal austerity discipline. 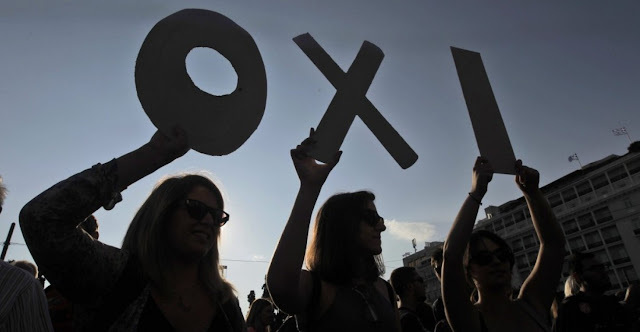 The Syriza-led government found itself in a harsh and pressing dilemma: it would either have to oversee the implementation of a new neoliberal adjustment program, or it would have to assume the political cost of a bankruptcy, with all its disastrous effects on the Greek population. Within Greece, after a full circle, the debate on our future beyond austerity has only now started. The resounding 61% rejection of austerity serves to remind us that this debate is now urgent, and the reactivation of the social movements that envision new social relationships built from below is imminent, after some years of relative demobilization. We have ahead of us a new cycle of creative resistance, of forging collective subjects and of tireless experimentation for the bottom-up transformation of our reality.